Critical fire weather conditions developed across the southern U.S. plains during the afternoon of 30 January, 2018. A 1-min mesoscale sector was requested to support NWS efforts in early detection of wildfire hotspots, as has been done in the past. A fast-growing wildfire was captured in northern Oklahoma, shown in Fig 1 in a VIS/IR wildfire sandwich combo. This image combo includes 0.64 um VIS as the underlay with semi-transparent 3.9 um SWIR as the overlay. For the shortwave IR, only the hottest pixels are shown. The color table is made such that the user can easily adjust the range to account for changes in season and/or time of day. The image combo allows for monitoring of the hotspot and smoke plume in a single pane. An upper-level closed low and associated deepening surface low pressure system brought snowfall from New Mexico to the UP of Michigan and severe weather to the ArkLaTex region on 21 January 2018. Additionally, strong surface winds associated with the storm system caused a blowing dust event across west Texas. GOES-16 provided valuable information to forecasters across the middle of the US in forecasting and analyzing this event. The 10.3 – 12.3 um “split window difference” provide a great method for detecting and tracking dust. Recall, this blog has discussed using this channel difference in the past for detecting low-level moisture gradients from the clear sky. Negative values of this difference will highlight lofted dust as well. Figure 1 shows the situation across the southern Plains by combining the split window difference (gray/brown scale) for non-cloudy skies with the IR Window channel(bright colors) for clouds. The dust appears as brown, and can be seen spreading from west Texas into southwest Oklahoma as it wraps around the deepening low. The shades of gray are mainly clear skies. To the north, snow-producing clouds are detected from Oklahoma through Nebraska into Iowa. To the east, convection is developing within a Tornado Watch. Additionally, low-level GOES-16 derived winds (white barbs) indicate wind speeds over 40 knots at the top of the dust layer. Taking a closer look at the convection over Oklahoma and Texas using GOES-16 5-min VIS/IR sandwich combo, storm growth was not all that explosive in an environment characterized by meager instability and high shear (Fig 2). 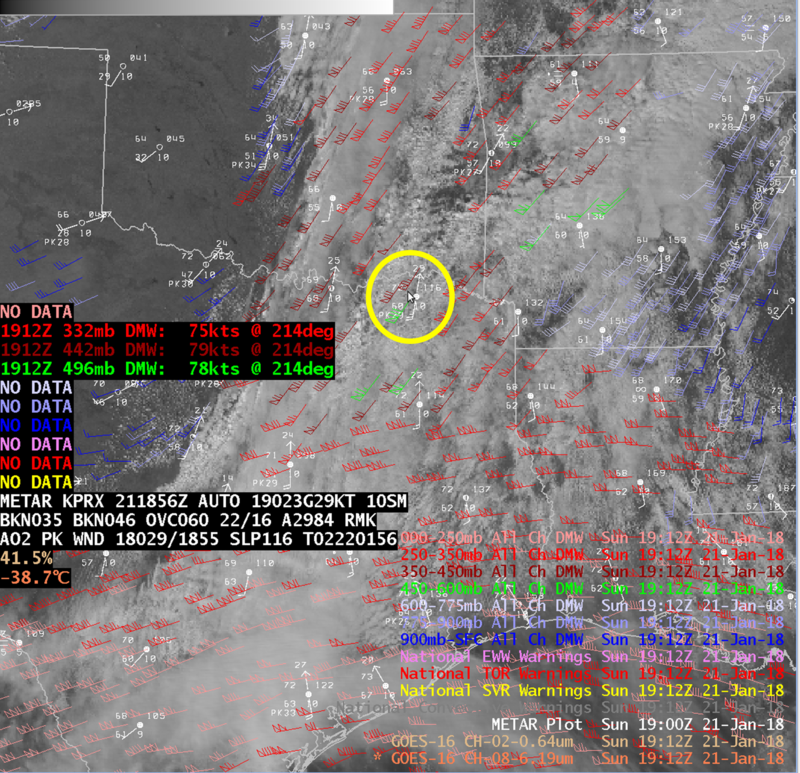 Blowing dust is also observed in the 0.5 km visible imagery making its way into Oklahoma. GOES-16 Derived Motion winds can be combined with surface obs to determine deep layer bulk shear values (Fig 3). In this northeast Texas example shortly before storms developed, surface winds of 23 knots from 190 degrees and GOES-16 400-500 mb winds of 78 knots from 214 degrees meant ~0-6 km shear values of 58 knots! Similar values were computed from elsewhere in the region. On 22 Jan, the winter storm continued to advance northeast into the upper midwest, producing heavy snow and blizzard conditions along its path. The GOES-16 day cloud phase distinction RGB allows one to easily differentiate the fresh snow (already melting) from clouds containing ice from clouds containing mostly water from bare ground (Fig. 4 and 5). Figure 4: 22 January 2017 GOES-16 Day Cloud Phase Distinction RGB. Full res. Previous posts discussed low cloud and fog detection at night using the GOES-16 Nighttime Microphsyics RGB (see here). That post in particular highlights a low cloud case in a warm air mass. In such a situation (warm regimes), the lowest clouds will appear aqua/blue. However, in a cold air mass the lowest clouds instead appear yellow to light green. This is because, while the red and green components remain similar in both temperature regimes, the the low clouds will have less of a blue component in the cold regime (cooler air mass so cooler in the 10.35 um channel). 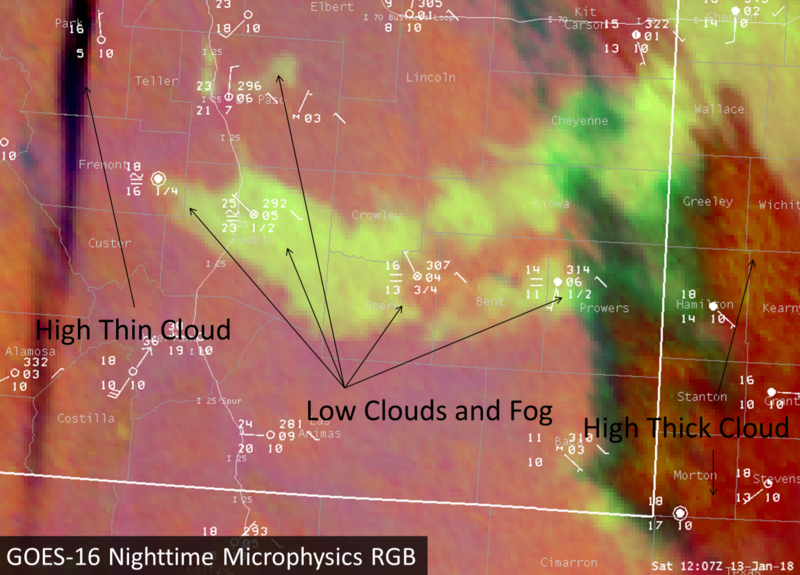 Analyzing the Nighttime Microphysics RGB across southern Colorado on 13 January 2018, fog, as confirmed in webcams and in METAR observations, appears as a light green to almost yellow (Fig 1). The 5-min RGB imagery captures the fog as it develops and evolves quickly across southern Colorado (Fig 2). The fog and low clouds appear a light green, while high thin clouds in the western part of the scene are black, and high thick clouds in the eastern part of the scene appear red. Towards the end of the loop, low clouds dissipate in El Paso County, but continue to fill in across the Arkansas River Valley. The RGB imagery was utilized by forecasters at WFO Pueblo to monitor the precise evolution of the fog and low clouds, especially in the vicinity of the PUB and COS TAF sites. A nor’easter was poised to bring significant winter weather impacts up the east coast January 3-5. Early on the 3rd, snow was already falling across the southeast US as the system began to strengthen just off the coast. GOES-16, which recently took over as GOES-East, provided stunning/useful views of the system as it progressed. The Day Cloud Phase Distinction RGB, previously discussed here, allows for easy distinction between low/mid/high clouds and snow. In the scene highlighted (Fig 1), the high clouds and convection (cold ice clouds) appear as reds to almost yellow, the low clouds (warm water clouds) are aqua/blue, and the snow is green. The clear sky, snowless land surface is a dark blue. The RGB makes these distinctions more obvious than when viewing any single channel, such as 0.64 um VIS alone (Fig 2). The nor-easter rapidly intensified during the evening of the 3rd as it accelerated north just off the east coast. The characteristic baroclinic leaf structure of the intensifying system is obvious in IRW imagery (Fig 3). The mid-latitude cyclone had deepened considerably and grown massive by the morning of the 4th, as depicted in the GOES-16 IR to VIS transition (Fig 4). Derived Motion Winds (DMWs) from GOES-16 were plentiful in the vicinity of the storm system (Fig 5). Low level winds measured over 70 knots in the vicinity of the low center over the ocean. Meanwhile, winds within the upper-level jet on the north side of the system measured to 160 knots between 200 and 400 mb! By the evening of the 4th, the system had traveled up the east coast and was just off the coast of Maine, producing strong winds and heavy snow along its path. GOES-16 full disk visible imagery from the day shows the vastness of the storm during the day (Fig 6). Finally, a 24-hr, 30-min GOES-16 6.17 um “upper-level water vapor” view of the rapid strengthening stage of the cyclone from the evening of the 3rd through the evening of the 4th (Fig 6).